Muscle Car Brakes all new Brake In A Box comes complete with both pair of High Performance Matrix Ceramic Disc Pads and Matrix Ceramic Brake Shoes, 31 LB Heavy Trick Spring Kit, Star Wheel Self Adjuster Combo Kit plus Rear High Volume Wheel Cylinders for less pedal pressure. In addition, Brake In A Box gives you a 2 to 1 better braking than OEM over the counter brakes. 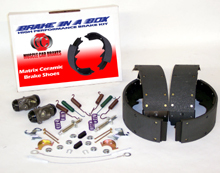 Brake In A Box is a direct replacement available for most pre-72 model GM, Ford & Chrysler cars and light trucks. Self adjusters may not be available on some older models.